For those not in the know (me), Stronghold is a historic real-time strategy (RTS) game developed by Firefly Studios in 2001. The game focuses primarily on conquest and expansion through military pursuits, but also provides space for economic strategy and development. There is both an economic and a military campaign to be played and both are discussed in the game manual. The game takes place in Medieval England and Wales around the time of AD 1066. 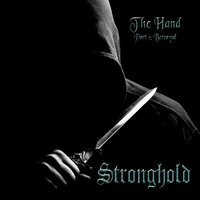 Stronghold is the brainchild of (names removed for legal purposes) lets call them Paz (guitars), Hedge (drums and vox), Pin (vox). Despite having a claw for a hand after playing Stronghold for hours on end, Paz had a vision, and that vision was to use recently written songs for his other band (Bleak Exist) as a tribute to Stronghold. Writing of the lyrics commenced with Hedge basing the premise of two Kings, one laying siege to the others castle. Firefly, the owners of the game gave permission for Stronghold to produce a musical tribute and the rest they say is history! I cannot be critical as it is far removed from my little melodic rock zone. I cant say that its right up my cul-de-sac, but the music is pretty riff-tastic. But... the even better news is that the album is completely free to download from their website (see below link). Go on, live a little and open up our ears to something new. Think Devin Townsend in chain mail ! Nice!